The St. Croix County Historical Society will host its 3rd annual Vintage & Variety Yard Sale Fundraiser on Thursday & Friday, September 20 & 21 from 8 a.m. – 5 p.m. and Saturday, September 22 from 8 a.m. – 3 p.m. The fundraiser will take place on the lawn of the Octagon House Museum at 1004 3rd Street in Hudson WI. This unique sale features items donated by Historical Society members and the community, for an eclectic collection including vintage pieces, antiques, furniture, home and garden items and much more. We are seeking additional donations from the community. 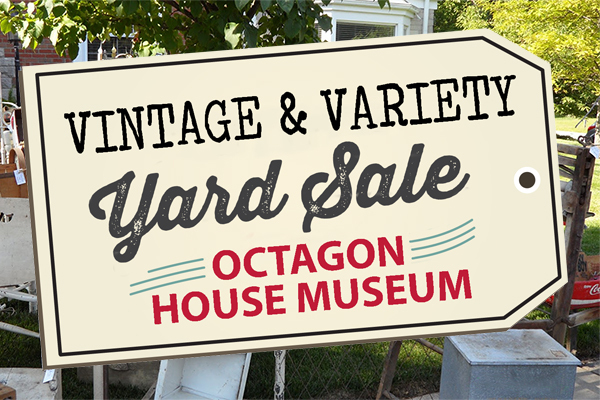 Donations of vintage pieces, household and other gently used items will be accepted at the Octagon House Museum on Fridays before the sale from 11 – 3 p.m. Please call with questions and for special drop off arrangements. Please keep this event in mind as a way to donate. The Historical Society is a charitable organization and donation receipts will be provided. Funds raised by the sale help support the Historical Society and the Octagon House Museum and our mission to preserve local history for future generations. Please limit clothing donations to vintage clothes or costumes, no adult clothing please. No large appliances or computer equipment please. For questions or more information about this fundraiser please contact the museum at 715-386-2654 or email us at OctagonHouseMuseum@juno.com. Restrooms available. The sale will be held rain or shine. The St. Croix County Historical Society maintains the Octagon House Museum complex, which is open for guided tours May through October & December. In addition to the gracious eight-sided house with Victorian era furnishings, the complex includes the Garden House with its 19th century life, domestic arts, carpenter, blacksmith, and general store tableaux; and the Carriage House, which includes the Museum Gift Shop and research center. All structures are set amid expansive, beautifully maintained gardens. The St. Croix County Historical Society will host its 3rd annual Vintage & Variety Yard Sale Fundraiser on Thursday & Friday, September 20 & 21 from 8 a.m. - 5 p.m. and Saturday, September 22 from 8 a.m. - 3 p.m. The fundraiser will take place on the grounds of the Octagon House Museum. We are seeking additional donations for the sale from the community. Donations will be accepted at the Octagon House Museum on Fridays before the sale from 11 a.m. - 3 p.m. Please call with questions or for special drop off arrangements. For more information about this fundraiser please contact the museum at 715-386-2654 or email us at OctagonHouseMuseum@juno.com.